The Village of Llanfair Pwllgwyngyll on Anglesey, North Wales. Llanfairpwllgwyngyllgogerychwyrndrobwllllantysyliogogogoch Rail Station. - The longest place name in the world. 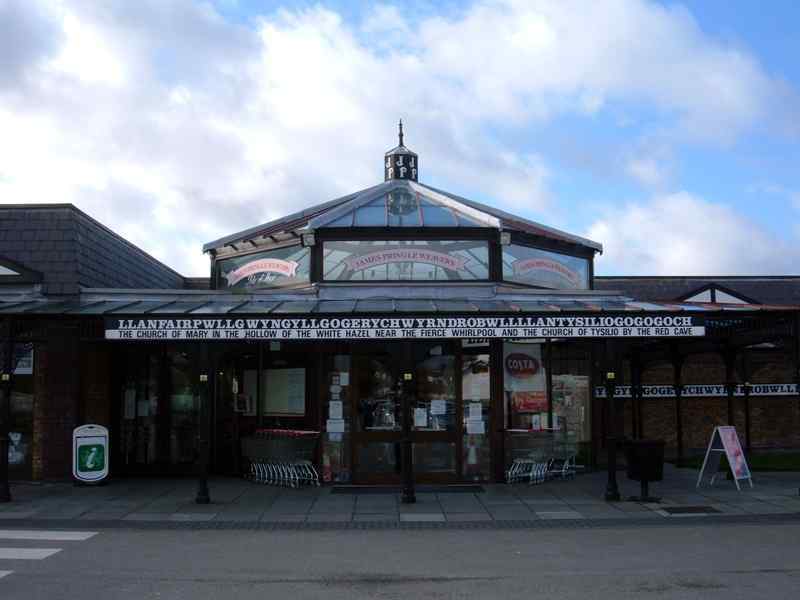 The town of Llanfair Pwllgwyngyll on Anglesey boasts the longest place name in the world. It was however originally called just Llanfair Pwllgwyngyll. With 58 letters, the full version is as the picture caption above. 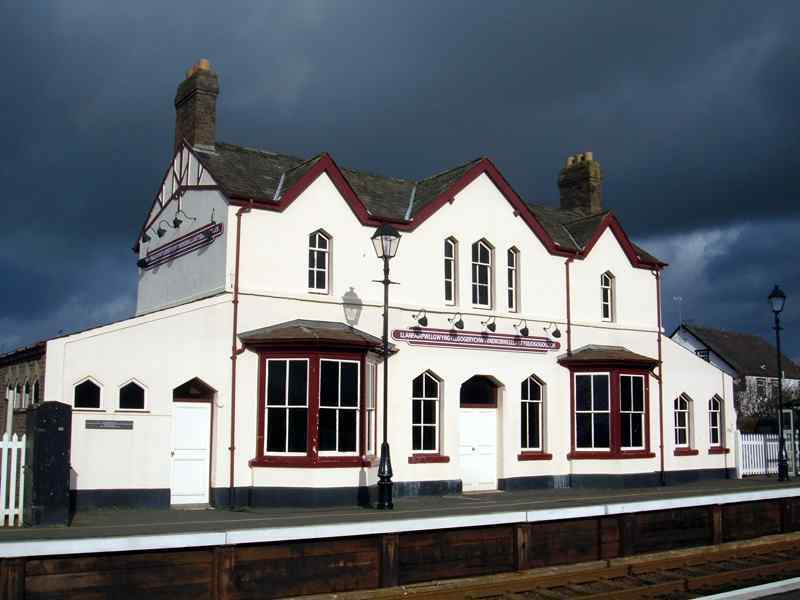 The railway station has been refurbished by James Pringle Weavers, and shares the same car park. When Thomas Telford completed his suspension bridge over the Menai Straits, and the main road from Holyhead to London was laid. 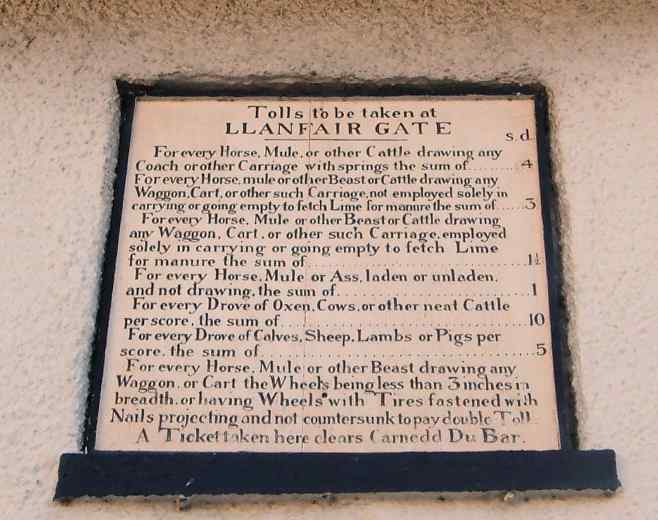 there were several toll gates and houses. 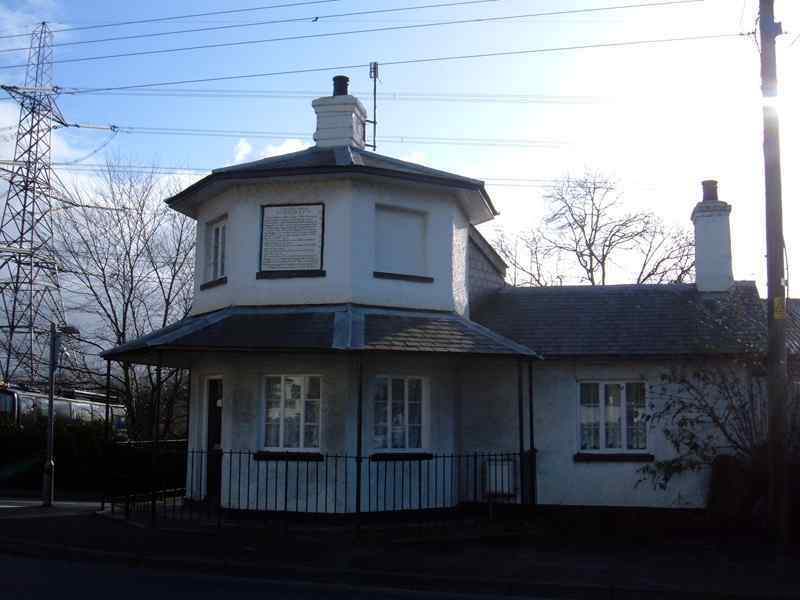 One of them is still standing at Llanfair Pwllgwyngyll., and displays the tariffs for access. Llanfair Pwllgwyngyll. is quite a small village, but with some interesting features. 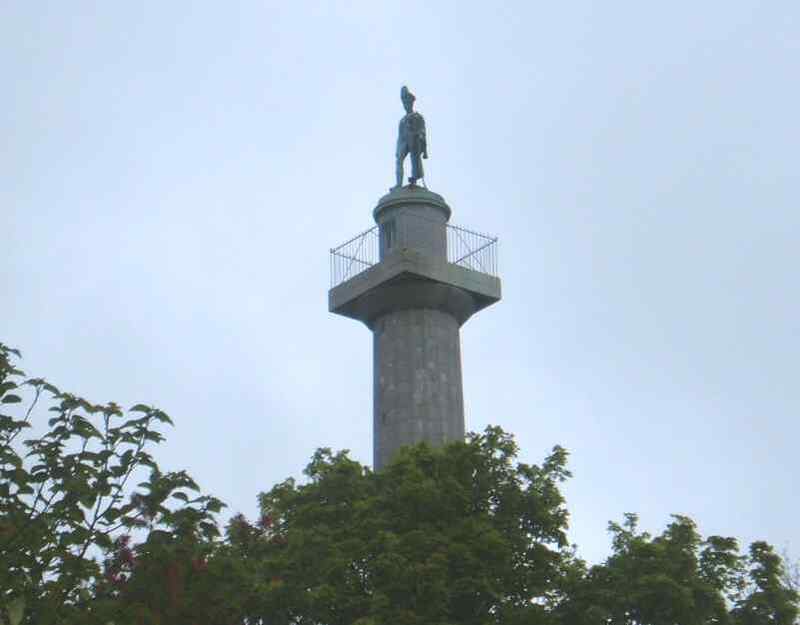 The Marquess of Anglesey lost a leg at the battle of Waterloo, and a column was erected in his honour. This is located at the top end of the village. If you visit the nearby church of St Mary, and take a short walk to the shore of the Menai Straits, you will see a statue erected to the memory of Nelson. This is also an excellent place to view the Menai Bridges. 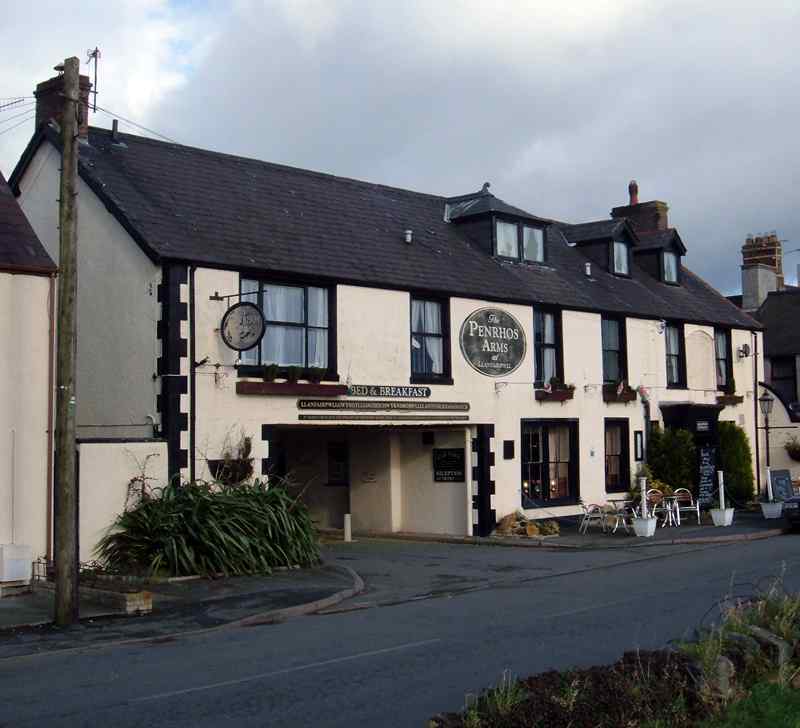 It boasts some interesting and old public houses, such as the Penrhos Arms. Nearby is the previously mentioned Marquess of Anglesey's Column, with its 115 steps to the top, it stands 28 metres (91 feet) tall. It was designed by the Chester architect Thomas Harrison. Built on the site of an ancient welsh fortress, it was built from limestone quarried at Moelfre. The column commemorates the deeds of this brave man, who was second in command at the battle of Trafalgar. The bronze statue of the Marquess was only added after his death. It is open to visitors at all times of the year. Entrance is just £1.50, and from the top the views of Anglesey, the Menai Straits, and Snowdonia are simply spectacular. Down by the banks of the Menai Straits stands a statue to commemorate Lord Nelson who was killed at Trafalgar in 1805. To get to the statue of Nelson one first has to pass through the grounds of St Mary's (Llan Fair) church, made famous in the 58 letter place name. The statue was erected by Admiral Lord Clarence Paget, 4th son of the 1st Marquess of Anglesey. Lord Paget was the occupier of Plas Llanfair - later bought by the TS Indefatigable - and Commander in Chief of the Mediterranean Fleet.